Discover the creative possibilities of block printing! 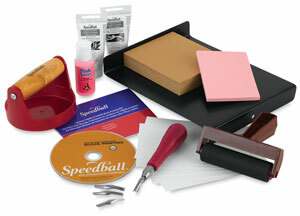 This complete kit puts all the tools and materials you need right at your fingertips. Plus it includes an instructional DVD that shows beginners exactly what to do. ® Speedball is a registered trademark.™ Speedy-Carve is a trademark. ™ Pink Soap is a trademark.